This morning I ran 16 miles with my two running buddies. I had never attempted that distance before and I was incredibly nervous about it when I woke up this morning. Previously my longest run was 14 miles, but that was back in August 2014 when I was training for my first half marathon and it did not go well. It was a disaster, if I’m honest. It was too warm, I was unprepared (my stamina was lacking as was my electrolyte/nutrition plan), and the effort mentally defeated me. (Luckily that wasn’t indicative of my performance during the Disneyland Half Marathon a few weeks later!) Since then I’ve run more half marathons than I can count and my performance at that distance has improved immensely, but now it’s time to get out of my comfort zone if there’s any chance I’m going to be prepared for the Disney World Marathon in January. I started my 16 mile run this morning with some apprehension, but it turned out great! I must admit that in that last half mile I started to feel fatigued, but I think that was mostly a mental response to being so close to the finish line. Also, I had a little too much sports drink near the end of the run which made my stomach sloshy and a tad queasy. Lesson learned. While I’m encouraged by the success of today’s long run, but that doesn’t mean it was perfect. The orthotic in my left shoe started bothering me at about the 12-mile mark. There’s some kind of imperfection on one of the edges and it caused a small blister to form on the outside of my heel. Nothing major, but I need to take it to my podiatrist and see if there’s anything he can do to fix the problem. As the runs get longer the blisters will only get worse, I’m sure. And speaking of blisters, before Halloween I started getting blisters on my big toes again. This was a major obstacle I had to overcome when I started running in 2013. Back then the solution was to consult a podiatrist, and subsequently, having custom orthotics made and wearing stability shoes. This time around I was stumped since I hadn’t changed anything about my footwear when the blisters started forming. I initially thought my shoes were worn out so I started running in a new pair, but that didn’t make a difference. Then based on some input from other runners, I tried some new socks in case my current favorites were shot. Again, no difference (but having new socks was still a plus). So I took the next step and went to see my trusted podiatrist, and he came through with a solution, as always. My orthotics are more than two years old so the padding was worn down and needed to be replaced. Luckily he resurfaced them within a day so I got them back in time for the Rock N Roll Los Angeles Half Marathon on October 30th. Since then I’ve had zero blister problems. That was a big relief. I didn’t want something as stupid as blisters derailing my marathon training. Hopefully I can handle whatever else gets thrown at me between now and January 8th. Only seven weeks to go! Thanksgiving is on Thursday and I’m behind on my preparations! I was so proud of myself for getting my Halloween decorations up early in October, but the Thanksgiving decor is still languishing in boxes on November 18th. Oops. Not that I have much, but I bought something new for this year that I’m excited about. I don’t have much free time this weekend (running and Florida football tomorrow, and then Disneyland with a friend on Sunday), but I’ll have to make sure to carve out an hour somewhere to make my house appropriately festive for Thanksgiving. I’ll share a picture when I’m done. I’m leaving for Florida on Tuesday so there aren’t too many days left for me to enjoy the Turkey Day items here in California. It’s going to be time to put up my Christmas tree as soon as I get home next weekend. I actually bought a new tree this year because while my old one was really nice, it just took up too much floor space. My downstairs area is oddly situated so there isn’t really a natural space for the old tree where it wasn’t taking up too much premium real estate. So in order to save space and still have enough branches for all my ornaments I bought a taller pencil-style tree. I can’t wait to see what it looks like. I realize that I should have purchased some additional garland when I was at Target yesterday. That’s one more thing I should do before I leave for Florida. But I’m getting a little ahead of myself. Before I worry any more about Christmas I need to get ready for Thanksgiving. This weekend I need to decide what recipes I want to make for Thanksgiving dinner so that I can assemble a grocery list. I’m planning to go to the store immediately after arriving in Tallahassee on Tuesday night. Hopefully I’ll avoid the Wednesday rush that way (although I expect I’ll still need to shop on Wednesday because I inevitably forget something on the first trip). But right now I need to get ready for bed, though, because I am running 16 miles in the morning with my running buddies. Yikes! The Avengers Superheroes Half Marathon on Sunday started in much the same way the 10K did on Saturday, specifically with a 4 AM wake up. Except for the Disneyland fireworks waking me at around 9:30 PM I slept pretty well the night before. I’m not always successful at getting to bed that early before a race so even with the brief fireworks interruption I call it a win. 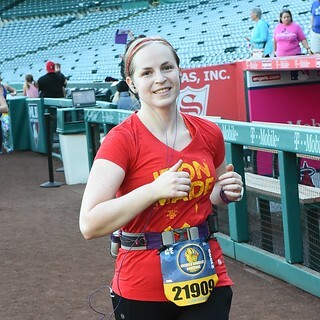 I wore an Iron Man running shirt to represent my favorite superhero. I had Captain America shirts for both the 5K and 10K, but Iron Man is always going to be my favorite. Once again I was able to negotiate my way to the front of my corral (E this time) so I wouldn’t get stuck in traffic once we crossed the start line. And it worked just as well as Saturday too. 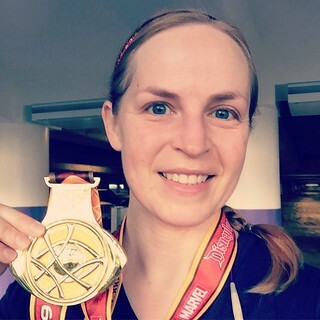 My original intention was to take it relatively easy during the half marathon, and I ran my first few miles at a fairly leisurely pace, but after that I started to speed up. When I saw that miles 5 and 6 were both under 11 minutes each I had a fleeting hope of achieving a new half marathon personal record that day. 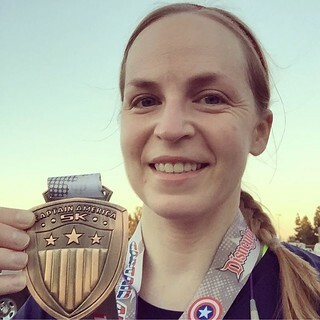 The Avengers Half Marathons in 2014 and 2015 both earned me new PRs (2:46:24 and 2:39:47, respectively) so it wouldn’t be too far-fetched for 2016 to have the same result. But I didn’t think about it too much, and I certainly didn’t do the math in my head to see how fast I’d have to run to break my 2:34:18 Long Beach half marathon time from October. That would have stressed me out too much so I just ran at whatever pace felt comfortable. I felt great most of the time (even when the sun came up and it started to get warm), including while running through Angel Stadium (see above photo). 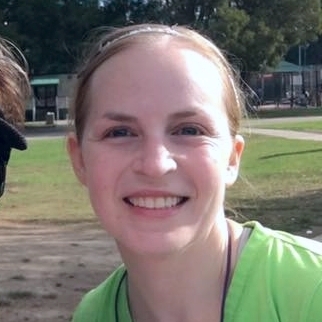 Usually I’m exhausted by then (around mile 8 or 9) so it was nice to still have some energy at that point for a change. It wasn’t until I glanced at my watch at mile 12 that I knew I’d done it. I crossed the finish line of the 2016 Avengers Superheroes Half Marathon with a time of 2:27:44 – a PR by over 6.5 minutes! I couldn’t believe it! I was completely elated as I collected my half marathon and Infinity Gauntlet Challenge medals and walked back to my hotel. An even better result of the week was maintaining my Avengers Half Marathon legacy status for a third year. If I can make it to five years I’ll be thrilled! When I started Nutrisystem on Labor Day I also gave up sugary sodas. I was seriously addicted to them at that point and I knew that my habit was adding a lot of unnecessary calories to my daily intake. So on September 4th I quit cold turkey. It turned out to be a perfect time because I was already suffering so much due to the severe dietary restrictions that I didn’t have any extra capacity to miss my daily Coke. In order to fill my stomach in between the meager Nutrisystem meals and snacks I drank a lot of water and some diet soda as well. Coke Zero worked just fine when I needed something with flavor, but without the calories that were derailing my weight loss. Since Labor Day I have broken my ban on sugary sodas only twice – once at the chili cook-off on Halloween, and once at a service anniversary lunch. At the chili cook-off one of my co-workers brought a bunch of specialty sodas from a store called Rocket Fizz so I absolutely couldn’t pass up a cherry cola. And it was totally worth the calories. That day was a diet-breaker already with all of the chili, chips, side dishes, and desserts so one soda didn’t make much difference! Then this past Monday I had a Coke while eating a catered lunch from Chipotle to celebrate a co-worker’s 25th anniversary with Boeing. That one I should have avoided. (Actually, I should have avoided the lunch altogether because I ate way too much! I had fun eating with my co-workers, but I would have been better off with my boring Nutrisystem food!) To my surprise, the soda didn’t taste as amazing as I remember. Usually with sweets once I get a taste I crave more. That wasn’t the case with that can of Coke. I enjoyed it, but it didn’t make me want another one. No more empty calories from soda! I’m free! It’s November 15th which means that I’ve successfully made it halfway through NaBloPoMo! This is leaps and bounds better than I’ve done for several years so I’m pretty happy about it. There’s still a lot I want to write about before the month is over (the presidential election and subsequent fallout, for example), but free time is somewhat scarce these days. Like today when I worked 10 hours, got home just in time to do a few chores, and then ran 4 miles to maintain my marathon training. I’m tired! Now I’m sitting on the couch watching episodes of “The Simpsons” while penning this fairly pathetic blog post so I won’t fail NaBloPoMo after making it this far. In order to wrap things up for tonight I’ll close by sharing a screenshot of my phone proving that the California earthquakes followed me to Arkansas! 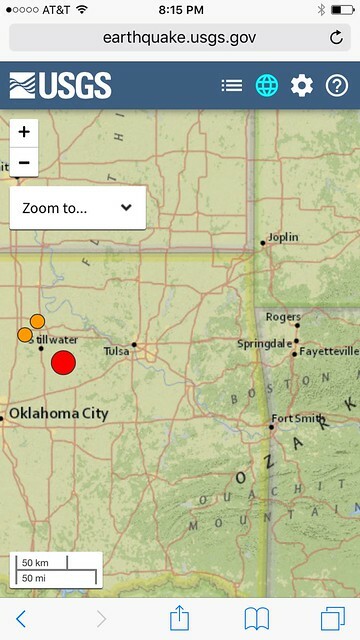 My parents and I were sitting in our hotel room in Fayetteville, AR on Saturday night when we felt this 5.0 quake from across the border in Oklahoma. I know that the area is no stranger to this kind of shaking, but I couldn’t help but feel partially responsible. Sorry everyone! I planned to use some of my free time after the Avengers Half Marathon today to write a comprehensive blog post about my weekend, but my brain just wasn’t up to it. After exhausting my body running this morning all I wanted to do was watch TV and zone out on the couch. So that’s what I did! But in order to continue fulfilling my NaBloPoMo commitment I need to write at least a little something today. Here it is! When I got home from Anaheim this morning there was a package on my doorstep. I wasn’t expecting anything so I was intrigued. When I sliced open the envelope two t-shirts fell out and I was pleasantly surprised. 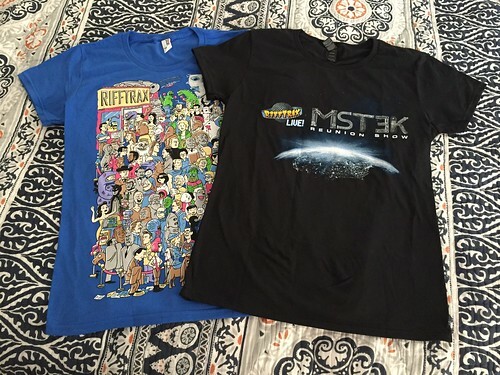 They were my backer reward shirts for supporting the RiffTrax Live MST3K Reunion Show Kickstarter campaign! The campaign was launched in March and given my love of both RiffTrax and MST3K I couldn’t resist pledging some money. The reunion show itself was in theaters back in July and I attended it with a good friend. It was a lot of fun. But before I discovered those t-shirts on my porch this morning I had completely forgotten that I was owed them! That’s what happens when it takes four months after the actual event is over for the merchandise to arrive. I won’t complain about awesome new shirts, though! I wore one of them to see “Doctor Strange” tonight. (Great movie! I highly recommend it!) Now I’m just waiting for my backer reward shirt from the Bring Back Mystery Science Theater Kickstarter that I contributed to last Thanksgiving. Believe it or not, it’s been almost a year! But if this is the price I have to pay for new MST3K shows I’ll gladly accept it! Back on April 5th I registration opened for the Disneyland Avengers Half Marathon Weekend. I initially signed up for the Infinity Gauntlet Challenge which includes both the 10K and half marathon races. I generally skip the 5K races because they are held on Friday mornings, and that makes them somewhat inconvenient for those of us who work for a living. However, when Run Disney released a preview of the race medals I deeply regretted not signing up for all three of the weekend events. The 5K medals used to be made of rubbery plastic (lightweight, but not exactly fancy), but earlier this year Run Disney decided to switch things up and offer metal 5K medals instead. This instantly increased the demand for spots in the Avengers 5K, which is Captain America themed this year. I tried to quickly register at that point, but according to the official website the 5K was completely sold out. I thought I had missed my chance. But then on October 14th I was looking at the Raw Threads running apparel website and discovered that against all odds they still had Avengers 5K registrations available through their club (which I’m a member of). So I signed up, and just like that I was committed to running all of the Avengers Half Marathon Weekend races. Fast forward to this morning when I woke up at 3 AM to get to Disneyland for the Captain America 5K. It was a great race, and I finished at a faster pace than I expected. Surprisingly, my GPS watch said that the course wasn’t quite 3.1 miles, but that’s OK. Even after only 3.05 miles and just under 33 minutes (32:59, to be exact) I still had a lot of fun. I love running at Disneyland. And it’s a good thing too because I have 19.3 miles of running in Anaheim over the weekend, starting with the Doctor Strange 10K tomorrow morning. Bring it on!